I made this card for a challenge at Splitcoaststampers.com last weekend. The challenge was to look at an Art Print and be inspired by the design, colors or layout and create something. I really tried hard to keep it simple with clean lines and also capture the essence of the inspiration photo. The embossed lines on the card were made with a Friskars Personal Paper Trimmer and a Bone Folder. 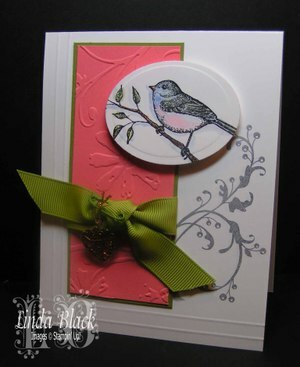 The bird is painted with Stampin' Up! Watercolor crayons and cut out with a Spellbinder Template. The panel was embossed with a Cuttelbug Embossing Folder. Awesome...love the sketch and embossing! This card is just stunning -- great colors!!! This is so pretty! Love the colors, embossing and everything about it.